The 4th Annual 2017 Youth Ultimate Coaching Conference is returning to the Bay Area on Sunday, March 12th, 2017. Early registration deadline is March 1. This year’s conference theme is “Building to Win,” which will focus on team strategies and increasing player & team competitiveness. Our highly trained and elite-level Instructors will lead you through how to plan your season and individual practices, how to best utilize your captains, and managing your team during a tournament. Gain hands-on experience teaching drills and working through critical player/team scenarios. All coaches, players, and captains, whether new or highly-experienced, will gain valuable skills and strategies to help your team flourish! Financial Aid: Financial aid is available upon request. Please complete this application by 3/1/2017. As we prepare for another spring season of youth ultimate, a growing menu of “professional development” opportunities have arisen. First — a new, potentially annual, coaches conference is being offered in February by RiseUp in south Seattle (WA). Then in March the third annual Youth Ultimate Coaching Conference will take place in San Jose (CA). If you can’t make these in person, both will offer video content from the speakers after the event: RiseUp for a small fee; YUCC for free courtesy of Bay Area Disc and all the YUCC partners (see Skyd Magazine for archived YUCC talks from 2014 and 2015). 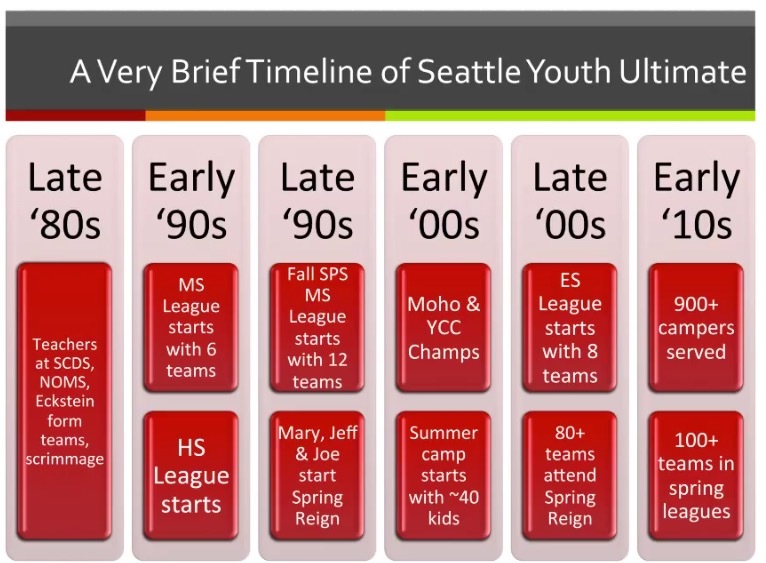 William Bartram (aka “Bunny”) had been Executive Director of the Northwest Ultimate Association (aka DiscNW) for almost 10 years when he gave the following presentation at the inaugural 2014 Youth Ultimate Coaching Conference. Joe Bisgianno — Northwest School? Trying now to serve teams that have fewer options? Low rate of success, but matches are valuable! Foul called on final point; resolved without violence; came back to win! (47:00) How do transition from volunteer to staffed organization? Managing DiscNW was done by operational Board and voluntary E.D. 2001: Part-time E.D. Mike Keiran (main job was to figure out how to fund his position!) IT guy, so he made changes to web site and forced payments (via a waitlist). As you get organized, you can deliver higher-quality events and therefore raise fees. Youth director was hired because Bunny was doing it on his own, but youth was a different customer! The new Executive Director of the Bay Area Disc Association announced in his 9/30/15 welcome letter that the theme for the 2016 Youth Ultimate Coaching Conference (YUCC) will be “Developing Girls’ Ultimate.” The conference is to be held next March (2016) in the Bay Area and plans to “convene inspirational role models from around the country like Qxhna Titcomb (All-Star Ultimate Tour founder and World Champion) to present…” Watch their youth ultimate event calendar for further details. 2:00 More important than these differences is how we approach the off-field culture and connectedness of the team. hi-5s are the most important part! Try to meet a goal. Each time you make it as a team, reduce your 10 planned 40-yard sprints by one. Supportive drills: e.g. 3 or 5 lines with people cutting towards you. By saying names and making eye contacts, you make a social connection every time. 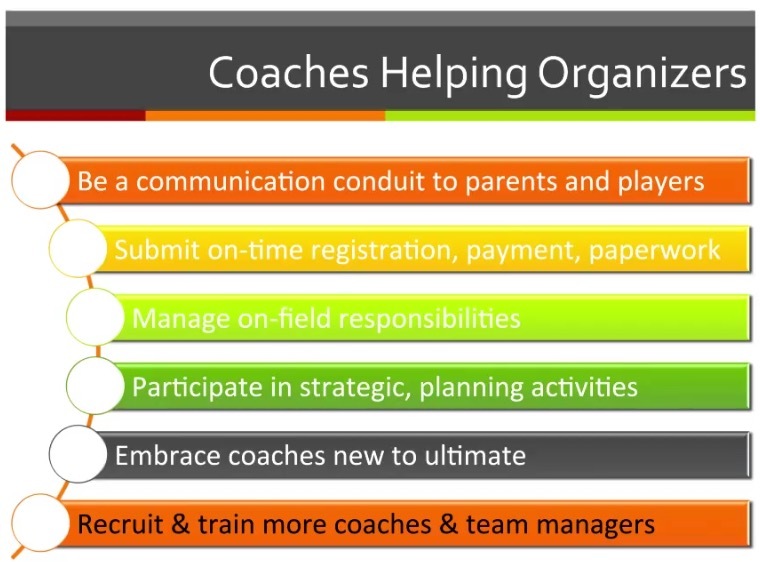 I’m really sad I can’t fly down to San Jose for the 2nd annual Youth Ultimate Coaching Conference (YUCC 2015) this weekend, but I was glad to hear that some content will be online via Skyd. The theme this year is Long-Term Athlete Development (LTAD).